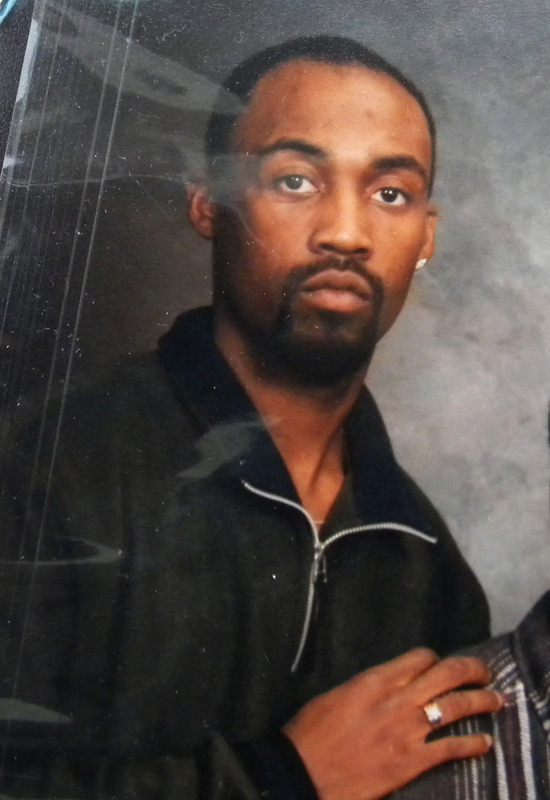 Just days after Johannes Mehserle was given a mere two-year sentence for the cold-blooded murder of Oscar Grant (see “Token Sentence for Oscar Grant’s Killer: Anger in the Streets of Oakland”), another unarmed Black man has been killed by police in Oakland. On Monday, Nov. 8, two cops from the Oakland Police Department (OPD) shot and killed Derrick “Dee Dee” Jones, an act that drew immediate outrage. As word spread, dozens of people gathered at his place of business and tens more outside his family’s home in somber vigil. All afternoon people were driving up and getting out of their cars to embrace Derrick’s family, offer their assistance and condemn the killing. All of the facts are not yet known, but what is known is that police were called to the barber shop because of a “domestic dispute.” Two cops confronted Derrick at his shop and then chased the unarmed man around the corner where they shot him multiple times in the chest, in a residential alleyway lined with houses and apartments. Police said they first used a taser but that Derrick ran away and they pursued him and shot him. They said they started shooting because they thought he was “reaching for his waistband” and that they saw something “shiny” in Jones’ hand, something they now claim was just a small scale. They also now say that a small amount of marijuana was found on Jones. As if that justified anything! Derrick’s sister Tonya, a recent law school graduate, told the media: “My brother was murdered. And we will prove it.” She also recounted that this was not the first time that the family or Derrick had been the victims of police brutality and that when Derrick was 16 he had been falsely detained and accused of stealing his own motor scooter, and when they brought Derrick home, police then had assaulted one of his sisters, and that the family had sued the OPD and caused two cops to be fired. 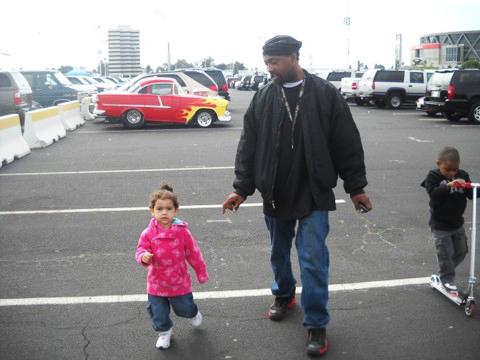 Like Oscar Grant, Derrick Jones leaves behind a small daughter, and many, many friends. Once again there is a jagged hole in the heart of a community. Once again a life full of potential, stolen by this system’s enforcers. ENOUGH IS ENOUGH! 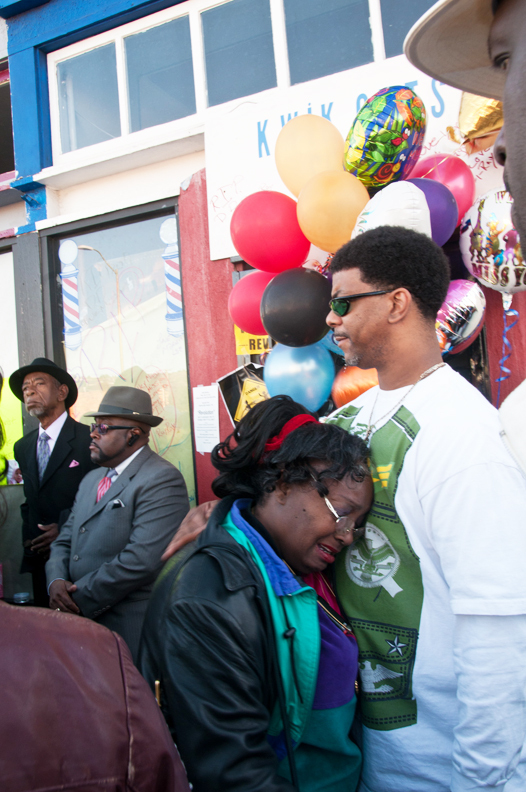 On Nov. 11, people in Dee Dee’s neighborhood, his family and friends, members of Oscar Grant’s family and people who have been fighting for justice in that case, revolutionaries, community organizers and religious leaders gathered at Derrick’s Quik Kuts barber shop 200 strong. The march took off at a fast pace, and the 30 blocks to the Fruitvale BART station – where Oscar Grant was murdered in 2009 – seemed to fly by. Copies of Revolution newspaper were snapped up, both by those in the march and people along the sides. A woman came up to a Revolution distributor and told her how her uncle had been killed by Oakland police a few years ago and there had been no protest but there should have been. She waved the newspaper in the air, punctuating her point that immediate protest and much more is needed. There was a defiant mood in the streets as the relatively small march spread out, taking up the whole of the width of the boulevard. 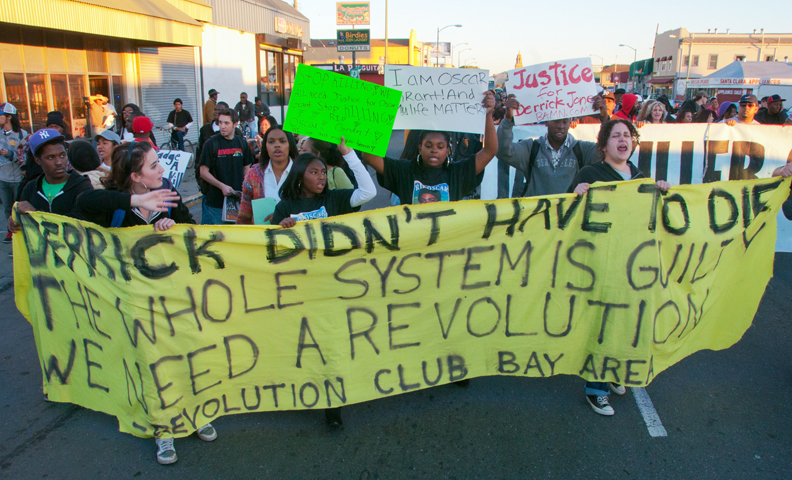 The Revolution Club carried a banner that read: “Derrick didn’t have to die. The whole system is guilty. We need a revolution.” Many people responded to the slogan “The Whole System Is Guilty” and there was fertile ground for spreading the word that another system was possible. 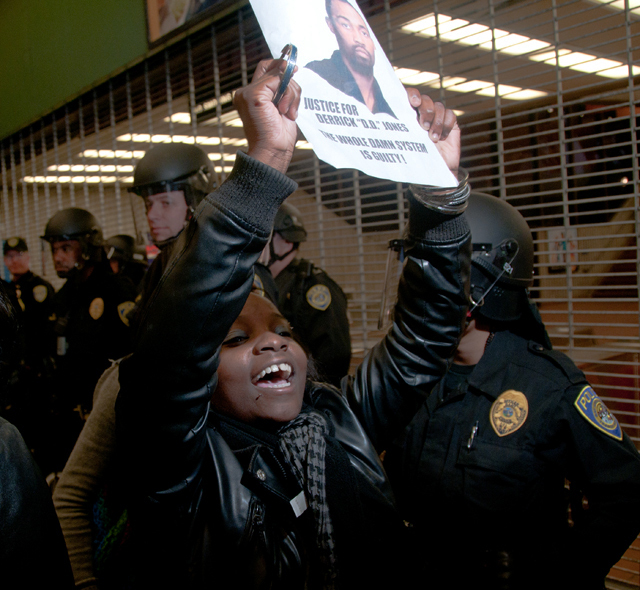 When the march arrived at the BART station, the crowd chanted their demand that the police who shot Derrick be arrested. The station was shut down. As people spoke at an impromptu second rally, the clash of programs among those who were protesting was evident, with some promoting stale reformism, others preaching against rebellion, and revolutionaries putting forward revolution as the solution to the great crime and epidemic of police brutality. The next day, on Friday, 50 people returned to the street where the incident began to protest again. After the rally broke up and people began to leave, police stopped and arrested and cuffed one of Derrick’s brothers several blocks away. This is an outrage on top of an outrage. This story first appeared on Revolution, voice of the Revolutionary Communist Party, USA.